As a building surveyor you will be involved in the development, management, conservation, refurbishment and maintenance of all types of real estate. On the course you will gain extensive knowledge in all the elements involved in building surveying, including construction technology, building pathology, project management, property management and property law. You will build experience through field trips, project work and practical workshops using specialist facilities. This includes the opportunity to learn Building Information Modelling (BIM) to level 2, giving you a competitive advantage when you graduate. Our focus on interdisciplinary learning means you will study and work alongside students from related courses, mirroring the real-world working environment you will experience after you graduate. Our network of local industry links and the option of a salaried professional placement year increases your employability and provides you with valuable networking opportunities. Visiting lecturers from industry share their knowledge and experience of professional practice with you. The course is accredited by the Royal Institution of Chartered Surveyors (RICS) and Chartered Association of Building Engineers (CABE). Through a shared first year across our construction and building courses, you will gain a thorough introduction covering key aspects of the industry. Core modules become more tailored to building surveying from your second year. In your final year you apply what you have learned to more complex projects and have the freedom to choose option modules in areas that interest you most. You will learn through lectures, tutorials, seminars, laboratory practicals and coursework. You will also take part in fieldwork, site visits, surveys and workshops, both individually and in groups, often with peers from related courses. You also have the option to enrol on this course part-time, giving you more flexibility in the way you choose to study. In your first year you will explore fundamental elements relating to the industry. This module will introduce you to the roles of construction professionals throughout the lifecycle of construction projects. You will research the design, construction and operation of buildings with a particular focus on your chosen discipline, widening your perspective of the processes involved at each stage and the statutory regulations that must be complied with. 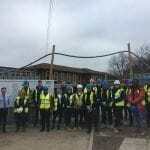 You will also take part in a residential field course, where you'll work in teams to gain an appreciation of the construction process and the different roles within this. This module will introduce you to the fundamental principles and techniques of architectural drawing and design, building technology and construction. This module is formed of practical guided workshops where you will be introduced to an industry standard CADD drawing package and learn how to use it to best deliver a set of skills which are essential in professional practice. This module will introduce you to environmental science of heat, light and sound in the context of domestic buildings and to building services. You'll develop an appreciation of services provision to meet the comfort criteria of domestic buildings and an awareness of smart control and sustainable services design. In your second year, you will build on the knowledge and skills you have gained in your first year and begin to explore aspects of building surveying in more depth. A placement year offers an excellent opportunity to gain work experience, build a professional network, increase your confidence, develop existing skills and discover new ones. The experience also significantly enhances your CV. 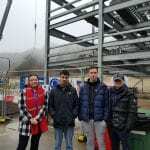 Students have been on placement in organisations including Johnson Gillies Chartered Building Surveyors and Building Consultants, Baily Garner LLP and Portsmouth City Council. In your final year you will develop and complete your individual research project. You will also choose from option modules, giving you flexibility to specialise in areas that interest you most. 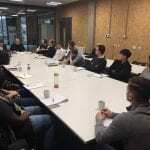 The Chartered Institute of Architectural Technologists (CIAT) Region 10 (South East Region), had their AGM (Annual General Meeting) at University of Brighton on Friday 15 March 2019. Our links with local industry will help you find placement opportunities and employment after graduation. Graduates have undertaken careers within companies including Malcolm Hollis, CBRE, University of the Arts, Mace, Portsmouth City Council, Stiles Harold Williams, Clifford Dann, Coppard Giles. And have taken on roles such as traditional chartered surveying practice, asset valuation, insurance assessment, estates management, construction management, project management, property management and facilities management. 28 points, with three subjects at Higher level. At least English language, maths and a science. Applications from mature candidates with built environment experience are welcome but are subject to RICS requirements. Contact us for details. Part-time students should apply direct to the university.